Amber Lake is a nice sized lake for a fun day of sailing and relaxation. This lake is a popular fishing lake. No motors are allowed on this lake. This lake would be fine to sail your swing keel sailboat on however I think due to its size its more appropriate for dinghy boats. As with many of the lakes in the Scab Lands, the wind is good on this lake. The lake is about 1 mile long with an average depth of 5-15', and 40' at its deepest point. Amber is 11 miles southwest of Cheney on Mullinix Rd. ONLY Electric motors are allowed. Amber has a public access via a boat launch. There is a large upper parking lot with restrooms with NO running water. Directions: Merge onto I-90 w / US-395 s., take the WA-904 w Exit- Exit 270- toward Four Lakes / Cheney, stay straight to go onto WA-904 / lt Col Michael Anderson Memorial HWY., turn left onto S Mullinix Rd., turn right onto W Pine Springs Rd., go straight. Turn left onto S. Houck Ave. and follow to boat launch. Signs to the launch are posted along W. Pine Springs Rd. Maps: To view a map click on google.com/maps and type in Amber Lake, WA. ACCESSIBILITY: PARKING... Large paved and gravel parking lot, with designed accessible and trailer parking spaces; PATHS/TRAILS... No official paths. At powerboat launch there is a paved route to the launch dock. Route path to powerboat launch dock is about 5% grade; RESTROOMS/FACILITIES… Fully accessible restrooms; SENSORY... No sensory tactile markers for those with visual and other impairments. DOCKS/LAUNCHES/PLATFORMS… One dock, one at powerboat launch; DIRECT WATER ACCESS… No access for wheeled mobility devices; TRANSFER SYSTEMS... None; CAMPING... None; O.T.H.E.R… Oddities/Barriers: Nothing unusual; Terrain: Level to about 5% grade at launch; H2O/Water: Water normally murky. 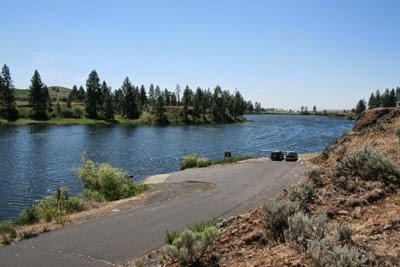 Water temperature in the summer can be around 60 to 70 degree; Environmental Conditions: High winds and hot temperatures in the summer; Resources: Food, drinks, and gas at Klinks Williams Lake Resort. June 8, 2017 at 3:18 PM: Your directions to get to the public access and boat launch are wrong. Cordill Lane is a PRIVATE road and there is NO lake access from that road. From Mullinix Rd people would have to turn Right onto Pine Springs Rd and follow the signs to the boat launch. Thank you for the note on the correct directions. Not sure how we missed that important detail.